Well, I never thought that I would enjoy oatmeal in a smoothie. It’s not really my thing for breakfast, much as I would like it to be for the health benefits. I’ve tried, but I can’t get past the texture. So when people started shoving it in smoothies, I thought maybe that would be the way I could manage it in the morning. Texture shouldn’t be an issue when it’s all blended up right? Wrong. The first time I tried it, I thought it was the most horrible drink I’d ever had. Absolutely awful. The texture was still an issue. It was obviously a bad recipe. Because this smoothie? It tastes like an Orange Julius. It. Was. Awesome. The trick to a good oatmeal smoothie, it turns out, is to process the oats first and then add everything else to it. There was still a little more texture to it then a regular smoothie, but not enough to bother me. And if it didn’t bother me, it’s unlikely to bother anyone else in the world – cause like I said, I’m not an oatmeal fan! My three year old and I thoroughly enjoyed this smoothie for lunch. It’s definitely very filling, it kept me full all afternoon without snacking at all. That’s something, since I’m usually raiding the pantry around 3:30, just like the kids! I don’t really blame them when they come home starving, I’m usually hungry around 3pm too. Not after having this orange smoothie for lunch! It’s super filling, as well as being very refreshing, healthy, and full of Vitamin C. Which comes in handy when you’re fighting yet another cold. I felt healthier just by drinking this. It might be making a daily appearance just to try and ward off the sickness that is running rampant around here! 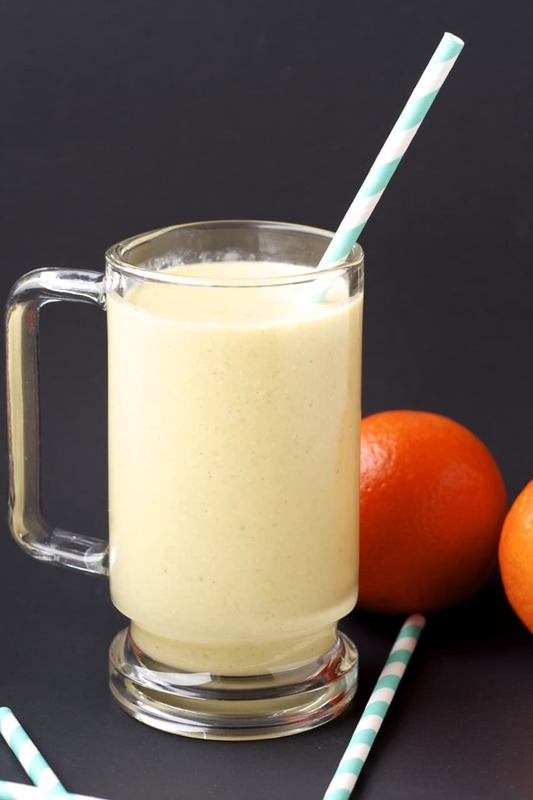 If you’re looking for a quick and easy meal that’s also very healthy, try out this orange oatmeal smoothie. It’s full of fibre from the oatmeal, vitamin C from the fruit, and some protein from the Greek yogurt. And it tastes delicious. I know what my breakfast will be! Place the rolled oats in a blender, and process until they are well ground. Add the rest of the ingredients and blend until smooth! Not sure it will taste like a creamsicle - although that would be fantastic! It reminds me of an orange julius more then anything. Nice and filling and tasty though - hope you like it! Hello! I came across your recipe and I was wondering if I could substitute the oranges for orange juice? Would that still work? Hi Sara - I haven't tried it, but I think you could probably sub about 1 cup of orange juice for the oranges. I think you would likely want to skip the honey then though as it would be a lot sweeter with juice. I think it would taste really good with orange juice too, just be sweeter I think. Let me know if you try it! Awesome recipe :-) thank you so much for sharing, now I have a perfect breakfast smoothie that keeps me full longer. And Instead of ice I put in frozen mango chunks! Love adding oats to my smoothie for days I want something more filing. I love the sound of your orange smoothie, it looks so delicious and refreshing! I love oats in my smoothie too! Yours looks amazing!! Hahaha, it's always harder in the winter too! I've been doing far too much baking as well, hence the smoothie for lunch! Thanks Ashley! I have heard of oatmeal cookie smoothies using oats, but I've never done it myself! I keep meaning to try - I think with fruit and protein powder, it'd be a really great, complete meal! 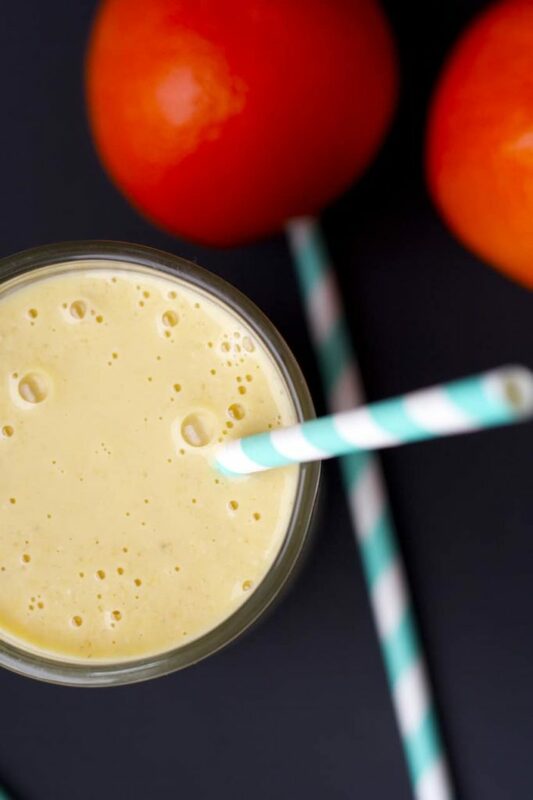 I love the orange in this - I love orange smoothies. They taste like creamsicles! This sounds wonderful! I'd actually never put an orange in a smoothie before, I was scared it would be too pulpy. But I was pleasantly surprised, this was delicious! Thanks Sarah! I've tried oatmeal in a smoothie and really enjoyed it! Need to try your recipe Stacey, looks delicious! Awww this looks awesome!! I love smoothies for my lunch. I'm not a smoothie breakfast kinda of girl, but for lunch its on. ;) I've never has oatmeal in my smoothie either. Going to make this tomorrow for my kids and I. Thank Stacey! Pinned!! 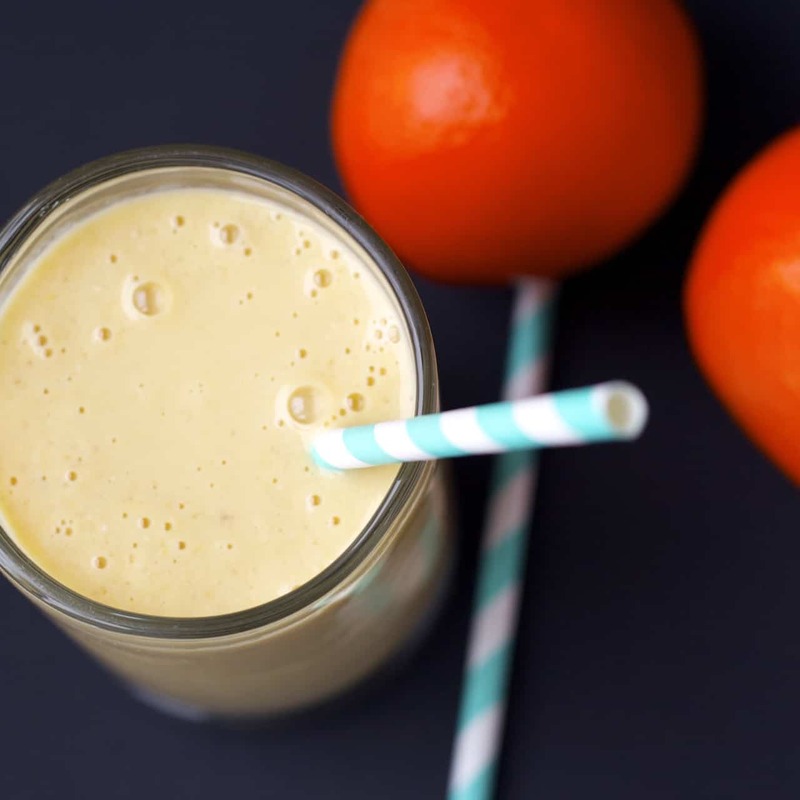 I've never had oats in a smoothie either, but this looks wonderful - love the orange color. Definitely need to try this! I'm so with you Stacey! I can really only LOVE oatmeal if there is some crispiness with it, but I do love it in smoothies. Love this orange version! Yum! Yeah, I like crispy oats much more than the mushy kind! :) Thanks Justine! I have never tried oats in my smoothie because it kind of feels weird + I know my hubby is never going to drink it! lol..but I love oranges so maybe I need to get rid of my fear and make this smoothie soon! looks good! haha I totally understand that Manali! I liked this one though! Thanks! I made an oatmeal smoothie once that was also terrible. I clearly need to try yours! Yum! I've never tried oats in my smoothies before, though I think I need to start! I'm loving this orange flavor, Stacey! I don't think I ever had an orange kind before, so I love how refreshing this is. Gorgeous color, too! Pinned! Thanks Gayle! I'd actually never put orange in a smoothie before either - not a fan of pulp in orange juice so I stayed away. I obviously have texture issues! But they blended up well enough that the texture was pretty minimal. I was pleasantly surprised!